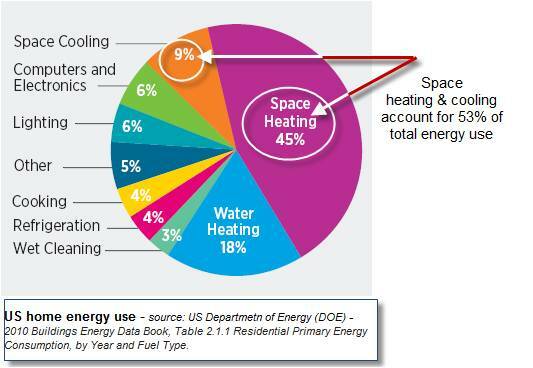 According to the Buildings Energy Data Book 2010, heating and cooling of space accounts for about 53% of our home utility bill. 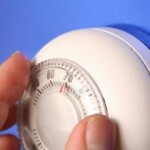 In continuation of our introductory articles “ US home energy consumption – Energy audit at home” and “Energy Saving Tips – easy, low cost tips to save energy at home” herein are some simple zero-cost energy saving measures you can follow for space heating and cooling.No matter what you use for heating and cooling you can save energy and money buy following these simple, zero-cost tips. 1. Consider keeping under climate control only specific spaces that you usually use; schedule your heating or cooling system according to the type of space usage. 2. Make sure you keep the filters cleaned on a regular basis and always remember that hot air should be directed DOWNWARDS for HEATING. 3. Reversely, when you are using an air cooling system, cold air should be directed UPWARDS for COOLING. 4. In case you are using heating elements, keep them cleaned regularly according to manufacturer’s instructions using appropriate brushers. 5. Avoid using systems of low energy efficiency; usual low-quality heating elements or air-heating fans consume a lot of energy ineffectively. 6. Use windows and shading effectively to your benefit. a. For cooling, during hot sunny days, keep all windows and openings closed and shaded with curtains, blackout materials or other shades (e.g. solar blinds) to keep the heat from coming indoors; during cool summer nights, keep windows open to ventilate and cool indoor environment as much as possible instead of using electrical air-conditioning. b. For Heating, make sure you keep all shading material away to let sunlight heat the indoor space. 7. Adjust the thermostat according to comfortable conditions all along all four seasons – if possible use a programmable temperature control system to allow optimum scheduling on a 24hr basis – when at home, when away, during the night etc. You can try 77-79F for winter and 66-69F during summer. 8. Adjust clothing in a balanced temperature environment; reduce your heating and cooling needs for winter and summer by dressing accordingly and sensibly. 10. Do not place any heat generating appliance near a thermostat – it will reduce its accuracy and interfere with temperature control and energy consumption. 11. It is always advisable to use ceiling fans instead of electrical air-conditioning. 12. Turn off your air-conditioning system at about 30’ minutes before you leave a place. 13. While using split-unit air conditioning, set it in the “auto” cooling and at high fan speed – fan speed should only be set low in cases of high humidity. 14. Check for air-leaks and openings in walls, window, doors, ceiling etc. – Insulate immediately with low-cost measures (e.g. insulating tape).